I grew up in a large, Gursikh household that was constantly active in the Sikh community through partaking in langar seva either at our house after akhand paahts, a random Friday kirtan, or at the gurdwara on sporadic Sundays. With my family of socialites, there were always people visiting and with that came lots of time spent in the kitchen. My sisters and I would watch my mom and dad cooking all the time. My most vivid memories of my childhood all involve food – a typical Saturday in my house consisted of my mom cooking in the kitchen, preparing for our weekly family dinners with our extended family. From any room in the house, you could smell an aromatic mélange of tadka (also known as the “Indian mirepoix”) being cooked. The intoxicating smell of cooked tomatoes, onions, garlic and ginger filled the house and encouraged our already full tummies to become ravenous once again. We didn’t believe in going out to restaurants – my mom would say “food cooked at home is always more beautiful, tastier and healthier,” and she was right! When we did go out to eat, I was never able to finish my plate because it was always too filling, and not to mention bland! At home, not only would I be able to polish my plate off, but I would savor every delicious bite crafted with care and expertise. Deliciously salty and slightly spicy dhaal makhani, juicy tandoori chicken legs and pakoras that were crispy on the outside and soft and delicious on the inside. Every meal was accompanied with cucumber raita or yogurt with boondi, which was my favorite. I remember thinking my dinner plate at home was a beautiful rainbow of food in comparison to the typical brown fried chicken and grayish mashed potatoes and gravy we would end up with at restaurants. Throughout all the langars and dinner parties, I grew more and more involved in the food preparation process, wanting to help my mom out somehow. She would have me do something “hard” like peel potatoes or clean the okra, and I was always in charge of making salad, my favorite task. As I grew older, my curiosity for food expanded. I started making meals for my family and friends on a regular basis. I was known for my famous chicken quesadillas and my trick was the super secret homemade spice blend for the chicken marinade, which, of course, still remains a secret! I started reading exotic recipe books before going to bed and venturing to stores at all ends of Massachusetts for rare ingredients like smoked to make an authentic tagine chicken and kaffir lime leaves for my tom kha gai. After I got married, I took a high-paced job in corporate wellness at a large firm on Wall Street. I really got involved in all aspects of living a healthy lifestyle during my time there. The demographic was type-A personalities who didn’t have time to take care of themselves and my team’s job was to create outlets for them to get the proper nutritional care. One thing that became evident was that the general population had no idea how to cook a proper meal for themselves. This revelation sparked my interest in furthering my culinary education so I could educate others about how to take care of themselves through the power of food. In 2009 my husband and I welcomed our first child into our lives, a beautiful baby girl. I was absolutely determined to make all my baby’s food at home and I did just that. 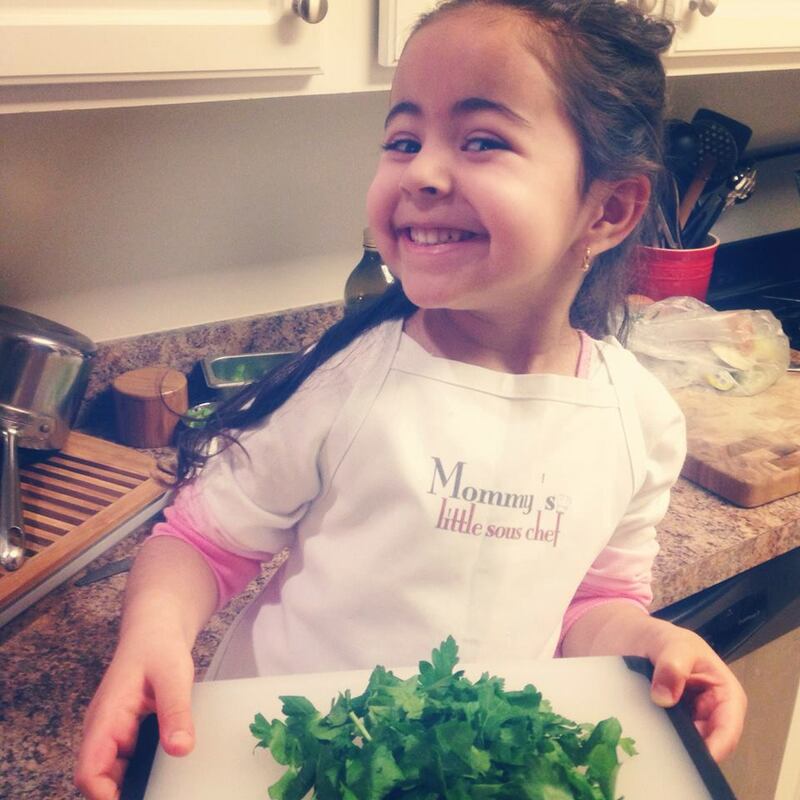 Some of Gia’s first foods consisted of cumin-spiced avocados and she loved it! We moved onto homemade mashed pears, apples, butternut squash and rice and daal. I started adding exotic spices early on and she literally ate it up. She loved ground fennel in her apples and coriander in her butternut squash. Gia was a little foodie before she even started walking! With all the experimenting I did at home, I realized that I needed professional training to help get me to my next step – to share this skill with others. I graduated at the top of my class in both Culinary Arts and Culinary Management at a well-established culinary school in New York City. Shortly after graduating, I enrolled myself in an integrative nutrition program and married my love of fine food to wellness. On a professional level, most of my time is split between teaching classes and seeing individual clients who need culinary and wellness assistance. I coach them on how to treat their bodies so that they last a long time. I love teaching people how to feed their bodies and their souls. My goal is to help create food fast, not fast food. I give supermarket tours where we learn how to read labels and educate clients on how to deconstruct their 10 PM chocolate cravings! I spend a lot of time in the kitchen with many different people at various locations but my most favorite time in the kitchen is when I’m with my family and we are making a meal together. A few months ago, we welcomed our second child, a little prince, into our family. One of the most important skills I can teach my children is to respect food and how to feed themselves properly. It’s crucial for children to know that their apples don’t just come from the shelves in a grocery store and that they were picked from trees off farms. Gia loves to be involved in the process of preparing dinner, so I take her out to the farm to pick fresh fruits and vegetables, to the fish guy to get fresh mussels and to the meat monger to get prime cuts of meat. As long as she sees where food comes from and is involved in the process, she is prone to eating it all. I want my children to be able to take this skill that they learn from me and share it with their families. It’s my way of leaving a mark on my future generations. 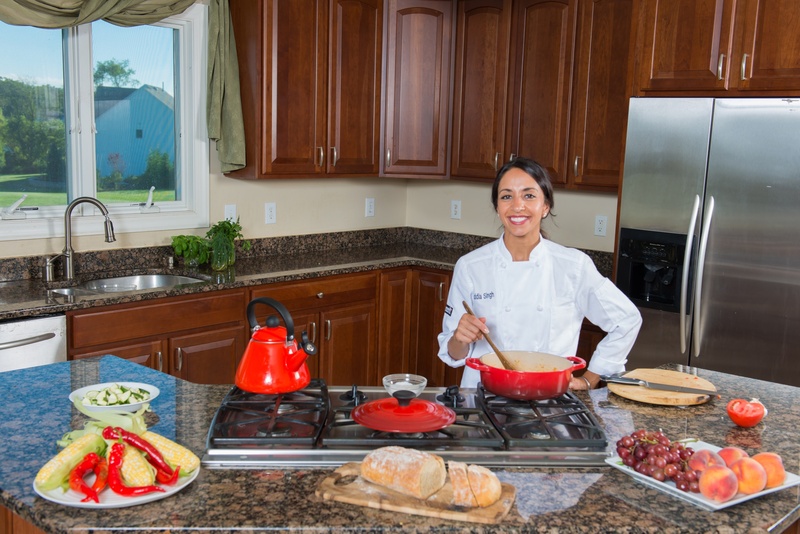 A Top Toque graduate of the Culinary Management and Culinary Arts programs at the Institute of Culinary Education, Licensed Wellness Coach, Chef Guddia Singh found her culinary voice in the health and wellness arena. With a strong background in public health and wellness, advocating a healthy and balanced lifestyle has become a mission.Chef Guddia is a chef-advocate for the American Diabetes Association and was a finalist for the Women in Culinary Leadership competition, founded by the James Beard Foundation. Past experience includes working in the test kitchen for Everyday with Rachael Ray. 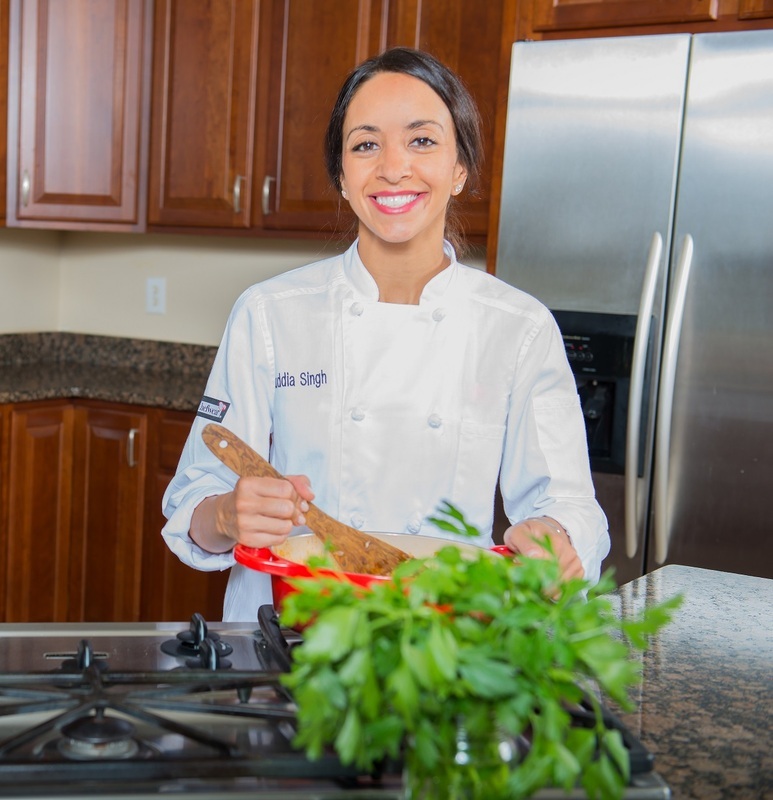 Currently, Chef Guddia advocates through her own culinary and wellness consulting business; teaching classes and coaching clients to adapt healthier lifestyles. Very nice Guddia. Pictures are beautiful. Glad we have you in our family. Sarah came home from her coking class today with a great deal to learning already and very inspired! Thanks so much!!! !